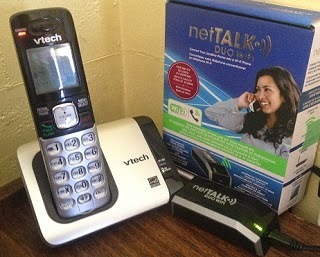 Home feature , freebie , Product Reviews NetTalk Duo Wi-Fi: Long Distance Calls for free! 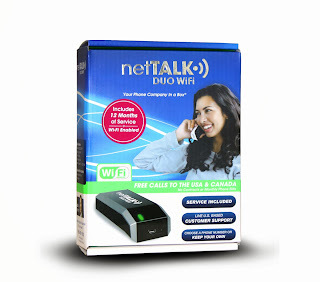 NetTalk Duo Wi-Fi: Long Distance Calls for free! 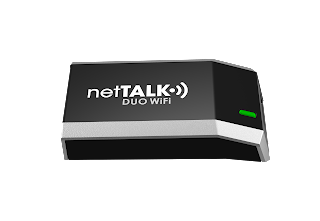 The past few weeks we have been testing the NetTalk Duo Wifi - a product in the similar vein as the MagicJack, which our friends have been using and raving to us about. The Magic Jack might be a little cheaper, but it does not have Wi-Fi capability and it does not support faxing. For us, WiFi was a necessity! 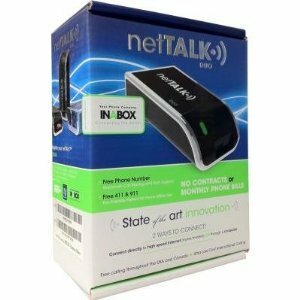 The box included the NetTalk Duo WiFi device, one USB cable, one Ethernet cable, an A/C wall adapter, a free Canadian phone number and a free extendable one-year of service. After the first 12 months, the yearly cost is only $39.95 CDN - much less than you will pay for just one month's Bell service! NetTalk Duo Wifi allows you to connect to the Internet in three ways; through your computer, through your router or anywhere you have a Wi-Fi connection. Which means you can even take it with you when you travel! We did run into a few difficulties, some because of our own equipment, but we were able to get everything working properly with the help of tech support. First we tried plugging the NetTalk device directly into my computer. It was very simple to set up, and it worked great! We made several long distance calls and no one could tell that we weren't using a regular Bell phone line. We did not have any dropped calls, or problems with the reception. So we were pleased! However, once we turned off the computer, the phone was no longer available. So if you don't run your computer 24/7 - that probably won't work for you either. Connecting to the router was our next option - then it wouldn't matter if the computer was on or not - the phone would always be available. Unfortunately in our house we had three computers in use, an Xbox and Smart TV, so on our Bell router all of our ports were in use. We bought a D-Link 5-Port Gigabit Switch to give us more ports - which was needed anyways, since my gamer son wanted more ports himself! No problem at all getting the NetTalk Duo Wifi device to work thru the router, either directly in the router itself, or thru the D-Link Switch. We were happy with that system, and would have left it like that. But it did require the phone to be right next to the router. Which may or may not be ideal for you. So next we tried the wireless option. The device would not set up properly on our desktop computer, but by using my laptop, which was wireless, and some help from Tech Support - it worked great! So now our NetTalk-enabled phone is sitting exactly where I want it, works all the time, whether or not the computer is on, and the reception is perfect! Since we are unable at this time to give up our Bell home phone, we now have two phone lines, one for personal and one for business. Plus all our long-distance calls are free! Perfect when family lives a long way away, or for out-of-town business calls. 1. If you want to keep your phone number (it's called number porting) - US readers should click on NetTalk.com, Canadians make sure to check on NetTalk.ca. GREAT NEWS! You are able to transfer your existing phone number to a netTALK device. 2. If you have any problems setting up your WiFi while using a desktop computer, try setting up through a wireless device. With our desktop, connected directly to the router, we could not get the NetTalk management tool to locate the device, and could only set up through the manual option. The automatic option would not even load. But once we set it up through my laptop, which was wireless, with a little help from Tech Support, the NetTalk management tool found the device immediately and the automatic option worked quickly! 3. If you were hoping to cut the cord and only use NetTalk, check with your current phone company rep. You need to request what they call a dry loop phone number, which will redirect your calls to your NetTalk number. A dry loop allows you to “unbundled” your Internet connection and phone line, so your Internet service remains active even when you transfer your phone number to NetTalk. Now you can "cut the cord"! NOTE: Most large phone companies, like Bell and Rogers, offer this service for free or at reasonable rates to their customers. Some ISPs might charge you more for dry loop than for their bundled packages and some smaller companies may not offer it at all. 4. 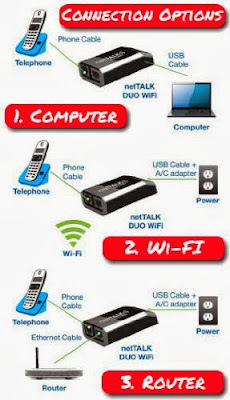 NetTalk Duo Wifi does rely on the Internet and external power so if your Internet is down or your power goes out - with no battery backup, you have no phone. Something to keep in mind if you are considering "cutting the cord" and getting rid of your land line. However, if you also have a cell phone, that won't be a concern. NetTalk Duo WiFi offers the same features you get from your phone company - all free with your NetTALK service: Call Waiting, Caller ID, Call Forwarding and Voicemail. Messages can even be sent to your email address and you can listen to them while on the go. Three-way calling allows you to add a 3rd person to a call. NetTalk Duo WiFi is available with a 30-day money back guarantee and can be found through many of your favorite retailers such as London Drugs, Best Buy and Future Shop as well as Staples and Amazon.ca and Amazon.com. The NetTalk DUO Wi-Fi is a sleek and small telephone device that connects directly to your router, computer, or wirelessly over Wi-Fi, creating a fax-friendly phone line with free calling features such as call waiting, conference calling, Enhanced 911, 411 directory assistance, visual voicemail (voicemail sent to your e-mail), and a videophone application. Integrated Wi-Fi wireless networking card connects to your home network, cutting the cord from your computer or router and allowing you to place it anywhere.